Easier than it looks! You will need a 23cm spring sided cake tin and baking parchment to line the base. Beat in a bowl with a spatula until creamy. Melt in a bowl over simmering water. Allow to cool but don’t let it go near setting. If you forget, just melt it again. Now assemble your creation: take the tin and base out of the fridge. Put the cream mixture in the tin and smooth over. 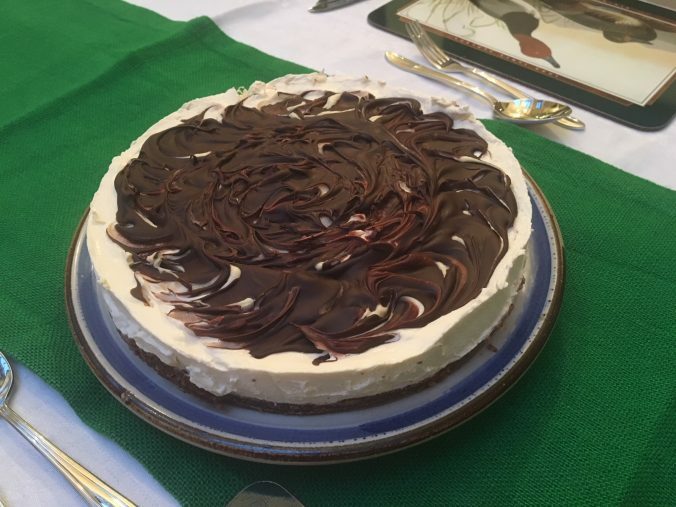 Pour the chocolate over the cream, and swirl with a skewer to make creative patterns. Now you can both chill for at least two hours. To serve, remove the cheesecake from the tin, dust with cocoa powder if you like (we forgot and it was still amazing), and cut into slices as required. Olwyn can’t have enough of this. 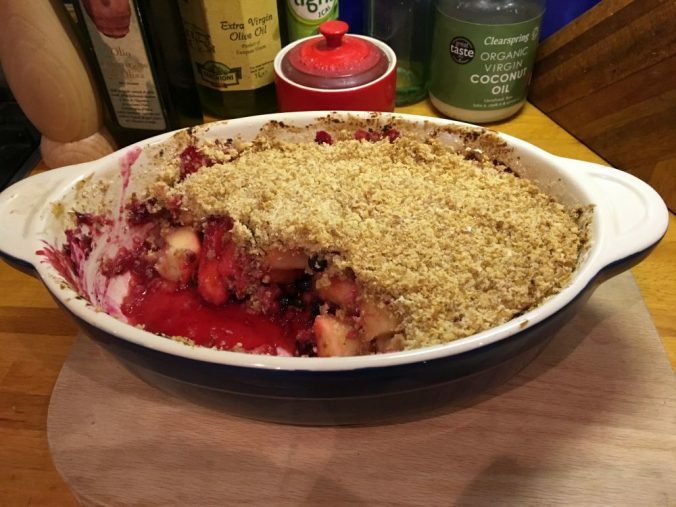 You can use any combination of fruit, but here is a recipe based on apple and summer fruits. Peel and chop the apples and put in a saucepan with a dash of water and a sprinkle of sugar. Cook gently for 5 minutes to soften. Transfer to a pie dish or similar and add the berries. Mix gently. Now make the topping. In a blender, whizz the butter and flour for a few seconds. Add the sugar and oats and whizz briefly to mix. Shake over the fruit to make a crust. Bake in a pre-heated oven at 190C for 30 minutes. Alternative fruits are rhubarb, apple and blackberry, cherry, peach and pecan nuts, pear and spices…anything goes. Probably not banana, although someone is bound to tell me it can be done. Easy and quick recipes for puddings in case you need to impress someone. Crush the biscuits by putting three or four at a time in a plastic bag and rolling a tin over them. Melt the butter in a pan or microwave. Mix with the biscuit crumbs. Line the base of the flan tin and gently press down but not too hard or it will become an impenetrable crust. Put in the fridge for an hour to firm up. Then spread the base with the caramel. Slice the bananas and layer on top of the caramel. Whip the cream (this will be tough without an electric beater! ), and blob it on the bananas. Sprinkle grated chocolate on top. (If you don’t have a grater, you can use a potato peeler). Done, and ready to eat – or chill but don’t keep it too long, a couple of days max. This recipe is more a set of creative guidelines, and the options are endless. You will need drinking glasses – small tumblers or large wine glasses. Then you will create three layers. Base layer: Crumbly. 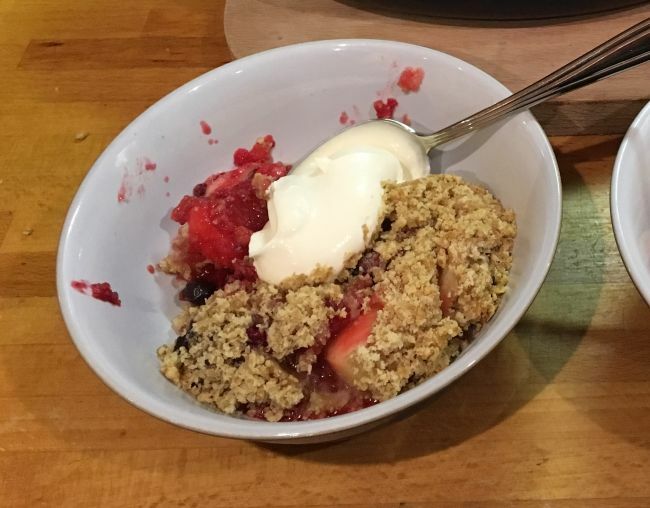 This can be based on crushed digestive biscuits, porridge oats or even Swiss-Style meuseli. Mix the crumbs with half their weight of melted butter. Layer in the bottom of the glass but don’t press down. Middle layer: Creamy. This can be creme fraiche, plain yoghurt, or yoghurt with a spoon or two of lemon curd or seedless jam swirled through. Chill it to allow the base layer to go hard which won’t take long. A slight variation on this is to use a can of rice pudding, a jar of apple sauce and blackberries. Put a layer of rice pudding as the base layer, then a layer of apple sauce, then a few blackberries, then more rice pudding, then a few more blackberries. Sprinkle brown (demera or soft brown) sugar over. Not your nursery food version. Preferably use a glass bowl for this. – Sherry – sweet, medium, dry, who cares. Slice the swiss roll in 2cm slices and line the bottom of the bowl, packing closely together. Pour the sherry all over it. Delia Smith says 60ml, Olwyn uses three times that. More if you dare. Slice the banana and add as the next layer, with the rasberries. Then pour over the cold custard. Whip the cream, and layer on top of that. Decorate with the almonds, or sprinkles. Not exactly difficult! The volume of sherry makes this either kiddy food or wow! food. This is just a mixture of sliced strawberries, broken meringue and whipped cream in roughly equal quantities, stirred about to look like a mess. Mush a few of the strawberries to make it messier. It does look a mess, but tastes good. It is a British Classic recipe.